MINNEAPOLIS -- At what point does the underdog label no longer fit? Cole Croston has worked hard to answer that question because every other one that has been thrown his way since graduating from Sergeant Bluff-Luton High School has been handled in an emphatic way. First, he was too small and not talented enough to stick with the Iowa football program as a walk-on. Then it was the doubts about his ability to hold up against Big Ten defensive linemen once he did get on the field and eventually started games at left tackle. 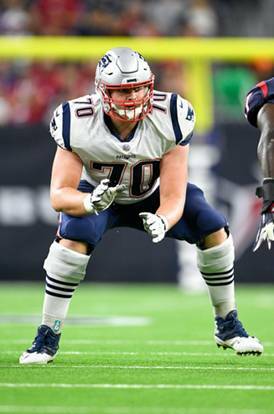 After his name was not called in the 2017 NFL Draft, Croston took a chance and signed as a free agent with the New England Patriots. That is a very good story. Undersized son of a former Hawkeye and NFL player proves the doubters wrong before getting a shot at an NFL training camp and moving on to whatever his life’s work will be after his brush with professional football. Except, Croston kept impressing coaches and when the big cutdown day came his phone rang, but not to tell him to bring his playbook to hand in. No, he was getting ready for the regular season. He was a member of the most dominant team of the last two decades. Now he is heading to the Super Bowl Sunday with the Patriots and if that is surprising just go back and read the last three paragraphs. The 24-year-old believes he remained on the Patriots roster because of that thing that separates most multi-sport athletes – versatility. "He is very athletic and what is hard to find is someone who is 6-foot-5, 315 pounds and is very athletic," said Croston's father Dave, who played for the Green Bay Packers. "That is why there are so few guys that can play offensive line at that level." Croston said he quickly learned that football was now his job as a first-year pro and has focused all season on ways to improve during and after every practice. "You hear 'do your job' all over the place and that is really all they want you to do," he said. "If all 11 players do their job on the field the play should be successful. "It has been a total pleasure to work with (offensive line coach) Dante Scarnecchia. He is a total expert at his craft, he has been doing this for 40 or 50 years, and what is great is we have formed respect for everyone on the line and I think it has brought the unit together." For many rookies, the first NFL season can be a challenging one. "He has been in Foxborough since May most of the time working out, the rookies are there every day basically, we are talking six months," Dave said. "My advice to him when we talked was the old cliche take it one day at a time and it is really true. It is a grind." Croston's week became about routine beginning with light work and lifting along with film work and study on Monday. Tuesday was an off day followed by a pads day on Wednesday. Thursday and Friday are more field and film work with Saturday set for final preparation before a Sunday game. Croston put that time to good use twice being named practice player of the week and appearing in three games -- eight total snaps -- late in the season. "There is no guarantees in the NFL but if you are helping your team with your practice ... that shows contribution, and at that level you don't get a lot of feedback," Dave Croston said. "They don't tell you 'hey, good job' because it is expected, but one of the things I told him is your feedback is that you are there." "Sometimes the naysayers are at the back of your mind, but at the same time I am just pushing myself to get to that next step for me," Cole Croston said. "I was able to do that earlier in my career and I have been truly lucky not to get caught up along the way, and so far we are still moving up. "I am just trying to be realistic knowing it isn't going to last forever and take it one day at a time. It is a blessing to be in the position I am in now." Croston and the rest of the Patriots arrived in Minnesota's Twin Cities on Monday to prepare for Super Bowl LII against the Philadelphia Eagles on Sunday. Whether Croston will dress for the game likely will not be known until closer to game time. "I didn't even know the Super Bowl was in Minneapolis until the last couple of games we were playing," he said. "It is pretty cool to be three, four hours from home playing the in the Super Bowl. Being in that position now is an incredible blessing." Croston said his parents, two brothers and both sets of grandparents are set to be in the stands at U.S. Bank Stadium to take in the biggest game of the season. "It is going to be a little surreal, I didn't really expect to go to a Super Bowl," Dave Croston said. "I am going to go and take it all in. The good news is most of the family is going and it could be a once-in-a-lifetime. Hopefully not but you never know. "I have always felt that athletically Cole is a better athlete than I was and I made it to (the NFL). It is very fulfilling to watch him do this." With Cole Croston in the Super Bowl, it marks the second time in three seasons a Siouxland football player has been on one of the final two teams playing in a season. Two years ago, former Bishop Heelan High School and Morningside College standout Brandon Wegher was part of a Carolina Panthers team that fell to the Denver Broncos. It is a feeling Croston knows will last. "It is going to an incredible feeling whether I am suited up or not," he said. "Being able to step on that field with the New England Patriots who are playing for the Super Bowl against a spectacular NFC team is going to stick with me forever."